Chelsia Rose Marcius Mary Help of Christians on East 12th Street. With few parishioners attending only one service per week, the nearly century-old Mary Help of Christians Church is officially on the market and making preparations to be sold. After what seemed like several years of rumors regarding the fate of the church on 12th Street between First Avenue and Avenue A, Pastor Kevin Nelan confirmed that developers have recently expressed interest in purchasing the parish. 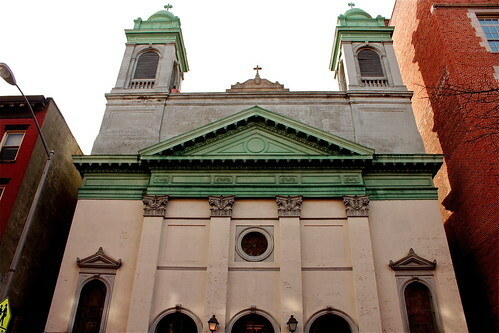 “The reason it hadn’t been sold earlier was because of the collapse of the real estate market in 2008; now, buyers are interested,” said Mr. Nelan, a pastor at Immaculate Conception Parish on East 14th Street, which has overseen Mary Help of Christians since 2007. Mr. Nelan declined to give the asking price of the property, but its city market value history report estimates its worth at $404,000. John Cicero, the managing principal of the real estate appraisal firm Miller Cicero, LLC, said that city estimates can be up to 45 percent lower than the true market value, which would make the church — a house of worship exempt from taxes — worth about $900,000. Only around 70 people attend a single, Spanish-language service on Sunday, making it hard to justify keeping the church open, according to Mr. Nelan. “That is just too small to sustain and, realistically, it’s just not possible,” he said. But according to Rafael Jaquez, 57, a former parish council member who still attends services, the church represents a vital sanctuary in tough times. Chelsia Rose Marcius Immaculate Conception Parish on East 14th Street. The church has often been regarded as a place for groups who felt unwelcome elsewhere. The Salesians of St. John Bosco, a Roman Catholic religious order, founded the church in 1898 at 315 East 12th Street during heightened tensions between Italian and Irish immigrant families in the area, said Patrick McNamara, the archival manager of the Archdiocese of New York. 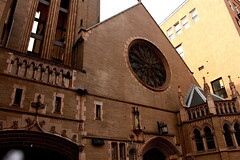 Like other Italian immigrant congregations of the early 20th Century in New York City, the Salesians were forced to worship in the basement to avoid clashes with their Irish neighbors. They relocated to 29 Mott Street in 1902 briefly before moving to 431 East 12th Street in 1904, which was later converted into a nursery. Services were held there until 1918, when the present-day location at 440 East 12th Street was built. For now, mass will continue at that building as it has for nearly a century. Mr. Nelan said that depending on the nature of the sale, developers could opt to leave a smaller area of worship open to the congregation. Other options for parishioners include converting the unused space underneath Immaculate Conception Parish into a chapel, or introducing a Spanish-speaking mass at Immaculate Conception Parish. Of course, parishioners heard this all before in 2007, when shutdown was supposedly imminent. Mr. Jaquez said that the congregation continues to pray for the salvation of the church, as it has for the last four years. For a more detailed history of Mary Help of Christians, pause the slideshow below and click through to read. This pamphlet was printed by the parish on the occasion of its 75th anniversary in 1974. Previous post Are You Stylish Enough to Work at The Standard East Village?